For the better part of 2 years my son, Benji, has been begging me to get a tattoo with him. I'm not sure how or why it became such an obsession for him, but an obsession it was. It was such an odd request because he knows I'm not typical tattoo material (which I realize sounds very prejudiced, but I digress). You see, I am Canadian born and bred, the daughter of an accountant and a librarian, a homemaker and a homeschool mom. The cherry on top of my "no-tattoo list" was that I'm a pastor's wife and I could very well imagine what some of our sheep might think. So fortified with all these reasons, I weathered the barrage of persistent attempts to sway me and stood my ground for a long time. I'd like to say I know exactly when I cracked open the door of possibility, but I think the shift happened so slowly and subtly that, before I knew it, I was actually entertaining the idea. Because I am always trying rather unsuccessfully to lose weight, I told him if I could lose 40lbs then I would get a tattoo to celebrate. To say that he finally sniffed hope is an understatement. He coached me from TN via text and phone calls, kept close tabs on my activity level and food choices and became my biggest weight-loss cheerleader. I did actually start to see the # go down, but I was secretly pretty confident that I would probably never meet my goal and would therefore remain ink-free this side of heaven. During this time, I mentioned what was going on to my friend and explained what had to happen before I would get my tattoo. She didn't say much, but the next day I received a text with a rather urgent plea from her to not make weight the focus and just get the tattoo. I know this girl loves me so I took it all in with an open mind and pondered how often I let weight affect my choices in life…to feel less than, to avoid being caught in pictures and now to keep me from making something, so important to my boy, a most unlikely prospect. And then it hit me…this wasn't about a number or a tattoo. This was about a relationship. A relationship with my almost 20 year old son who wanted his 50 year old mother to seal our amazing relationship with some ink. He hadn't asked this of one of his buddies, a teammate or another important figure in his life…he'd asked ME and I had the power to make it happen. Since it was only a few weeks away from Christmas, I decided to wait and have his tattoo and mine be the present he opened Christmas morning. I plotted and planned a way to tell him while I frantically searched the internet for every conceivable "script font" you can imagine. I mean, if I was going to have to look at this thing from here to eternity, I was definitely going to make sure I liked the font!! 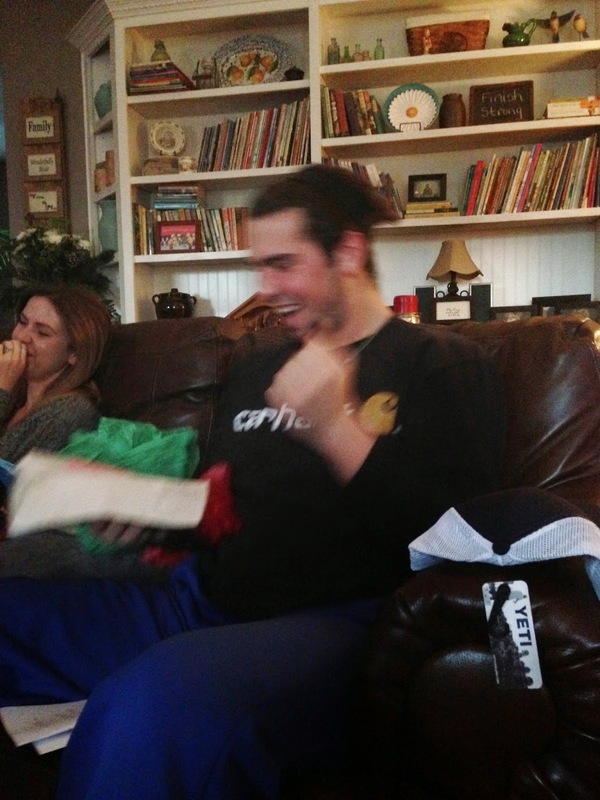 Is that pure joy, or what? I should point out at this point that I had spent some time strategically planning the placement of my tattoo and finally decided on the place I felt was least likely to sag as I continued to age…my foot. When the guy who was going to do my tattoo found this out, he told me that this was a highly sensitive area and gave me opportunity to change my mind. I assured him I was good and before I knew it the process had begun and Benji was hovered over me beaming from ear-to-ear. I'm not going to lie and say there was no pain but, after giving birth to 5 huge babies, I have concluded that pain is relative and this wasn't bad. I think the tattoo artist was rather surprised that I was taking it so well because when we were finished he proclaimed I was a "boss" and he couldn't believe how well I had done. 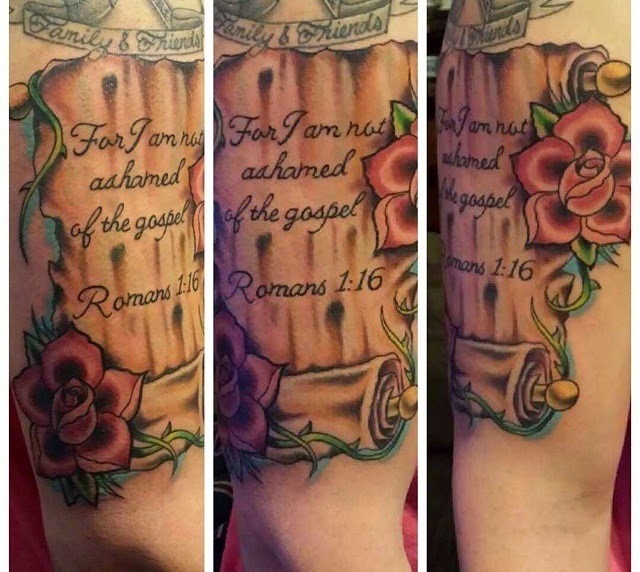 How is a Mama supposed to get mad when her baby wants to proclaim for all the world to see that he is not ashamed of the Gospel of Jesus Christ? He also has 2 big roses he says represent his dad and me because we were the ones who taught him not to be ashamed. *Sniff*Sniff* From now until the day he dies, he will have an instant opportunity to share his faith because he boldly wears its truth as a sleeve. So there you have it, folks. This introverted housewife-homeschool mom-pastor's wife is sporting her life verse for all to see. 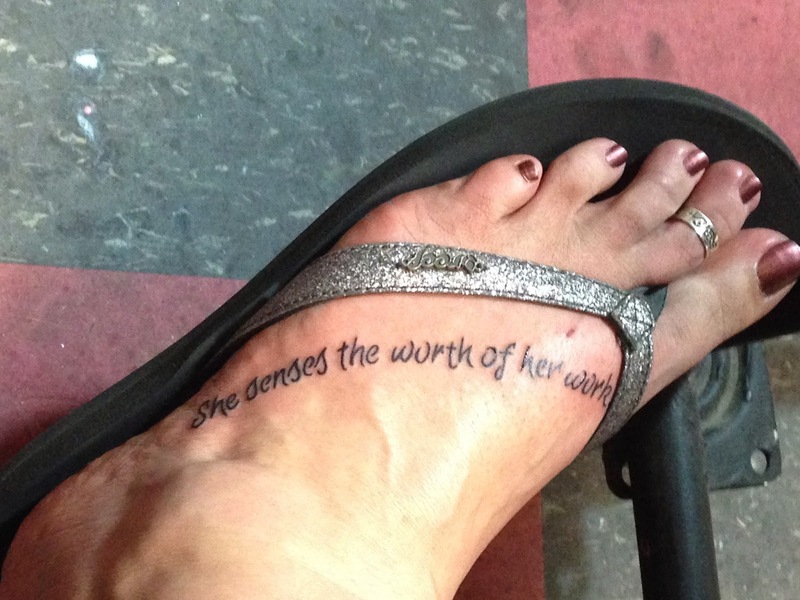 I wore my flip-flops (since I'm the Queen of flip-flops) to make sure of the positioning (because my friend pointed out I wanted to make sure I didn't lose some words in a strap) and I also had them write it so it was facing me and I could constantly be reminded…"She senses the worth of her work." There's a lot of things that fall into that category of "work" in my life on a daily basis, but none is more important to me than the work I put in building relationships with my kids!! That's okay…I've got a tattoo to prove it!!! Wow. That is an awesome story! I smiled through the whole thing! 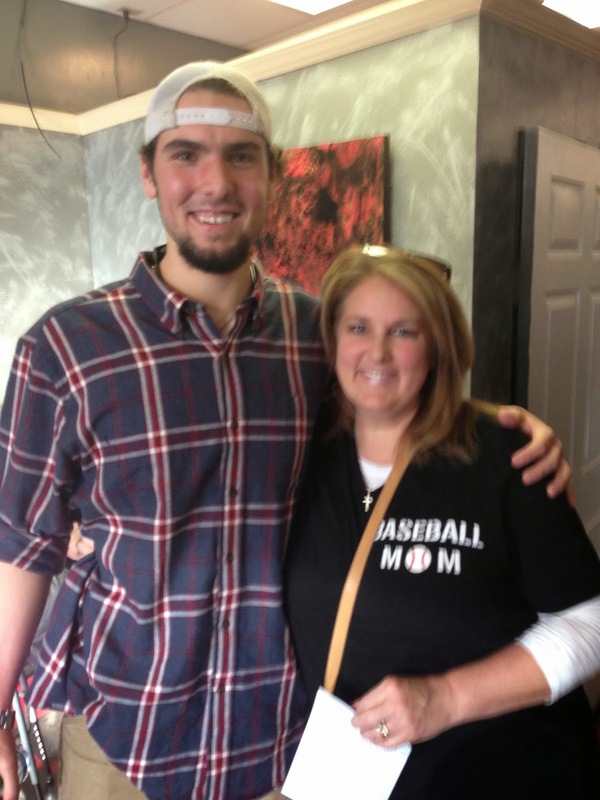 You are one tough momma. I have a flower on my foot. It hurt like the dickens! Love your story Barb!! Your love for your kids is an example I want to follow!! Blessings to you!! Barb,I searched 'Barb Cash blog tattoo' to find this post. LOL. I remembered reading it after you wrote it back in 2015. I have never ever had the desire for a tattoo. So it has never been an issue with me to find out if the Bible speaks to this topic. Until recently. My 20 year old daughter got a tattoo of a cross on her ankle. I thought ok - fine. It's small and it represents her faith. No big deal. Until today. She sends me a video of mothers and daughters getting inked together, each picking the other's tattoo. She wants us to get one together. I asked what she had in mind and she said mine would be an open book because her best memories from childhood are of me reading to her and her siblings. She suggested a quote from one of her favorite childhood books as the one she would get when I couldn't think of something for her because my mind was blown. :D I immediately thought of your story and found it to reread how you came to your decision. Thanks for sharing it. Any advice or prayers are appreciated.